For other uses, see Redhill (disambiguation). 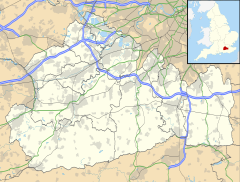 Redhill (/ˈrɛdhɪl/) is a town in the borough of Reigate and Banstead within the county of Surrey, England. The town, which adjoins the town of Reigate to the west, is due south of Croydon in Greater London, and is part of the London commuter belt. The town is also the post town, entertainment and commercial area of three adjoining communities: Merstham, Earlswood and Whitebushes, as well as of two small rural villages to the east in the Tandridge District, Bletchingley and Nutfield. Redhill is sited about 3 miles south of a minor pass at Merstham (elevation of around 120 m (390 ft) compared to a height of around 180 m (590 ft) on either side) in the North Downs, through which passes the London-Brighton road. Beneath this pass, two rival railway companies excavated the Merstham tunnels, which are still used by regular commuter trains and goods transport, with the two railway lines intersecting to the south of Redhill station. A major factor in the development of the town was the coming of the railways. Redhill railway station continues to be an important junction. A town formed here in part of the rural parishes of Reigate Foreign and Merstham when a turnpike road was built in 1818. The settlement was originally known as "Warwick Town" after Warwick Road, and became known as Redhill when the post office moved from Red Hill Common in the south-west of the town in 1856. Redhill is one of the few places in the UK where fuller's earth can be extracted, though production ceased in 2000. Alfred Nobel demonstrated dynamite for the first time at a Merstham quarry, 2 miles north of Redhill in 1868. A large, ornate, Victorian psychiatric hospital with well-trimmed grounds, the Royal Earlswood Hospital, initially the Philanthropic Society's farm school for convicts' children, which was first established in 1788 at St. George's Fields, London, relocated to Earlswood in what was the south of Redhill in 1855. Prince Albert laid the first stone in 1853; the hospital was for 40 years home to two of Queen Elizabeth the Queen Mother's cousins Katherine Bowes-Lyon and Nerissa Bowes-Lyon, both of whom had learning difficulties. Another inmate James Henry Pullen (1835–1916) was an autistic savant. He was a brilliant craftsman and artist whose work was accepted by Queen Victoria and Prince Albert. Some of Pullen's ship models, designs and art work used to be on display at the town's Belfry Shopping Centre but have now been moved to the Langdon Down Museum in Teddington. The principal building has been converted to apartments and the renovated grounds provide green open space to balance the large common south-west of Earlswood railway station. Richard Carrington, an amateur astronomer, moved to Redhill in 1852, and built a house and observatory. Dome Way, where Redhill's only tower block stands, is named after it. The site suited an isolated observatory, being on a spur of high ground surrounded by lower fields and marsh. Here in 1859 he made astronomical observations that first corroborated the existence of solar flares as well as their electrical influence upon the Earth and its aurorae. In 1863 he published records of sunspot observations that first demonstrated differential rotation in the Sun. In 1865 ill health prompted him to sell his house and move to Churt, Surrey. St John the Evangelist, built in 1843, was the first of Redhill's three Anglican parish churches. The parish originally stretched from Gatton in the north to Sidlow in the south. The construction, to the east of Redhill, of the M23 motorway between 1972 and 1975 reduced north-south traffic through the town. The natural gap in the North Downs north of Merstham is at an elevation of 120 metres (390 ft) above sea level. From this point run gently undulating slopes of significant chalk, sand, and some fuller's earth deposits, underlying regular (fertile) humus topsoil in the distance to Redhill's town centre (elevation around 75 metres or 250 feet). Similarly, Reigate High Street, further along the Holmesdale gap, is at an elevation of around 85 metres or 280 feet with a small hill immediately to the north where Reigate Castle is sited. Redhill Common, now partly built on at St John's, is on the Greensand Ridge. The Redhill Brook runs through the town, mainly culverted, and upstream to the immediate north-east of the town are The Moors nature reserve and the large 2010–2012 (mid and low-rise) Watercolour housing development, comprising 25 acres (10 ha) of lakes, paths and wildlife habitat managed by the Surrey Wildlife Trust. The brook enters a culvert behind Redhill station and briefly reappears at Halford's car park. The flat area of Redhill's town centre was formerly a marshy flood plain caused by its often silted waters. The railway and A23 also pass through or near the gap cut by the brook through the Greensand Ridge at Earlswood, just south of the town. The meandering stream joins the River Mole south west of Woodhatch, Reigate at an elevation of 50m metres (164 ft), after flowing southwards then westwards. Holmethorpe can refer to two neighbouring developments, one residential, the other commercial/industrial and separated by the west track of the Brighton Main Line directly north of Redhill. A Holmethorpe Industrial Estate member's organisation exists to provide security to and advertise recruitment among its 66 businesses and to work on traffic and local authority planning matters. Holmethorpe had at the 2001 census a population of 1,128. Watercolour is a 2008–2012 built settlement and neighbourhood in Redhill towards the village of Merstham across lakes from the Greensand Ridge of the wooded village of Bletchingley and on the site of the former Holmethorpe Gravel Quarry. Redstone Hill is above the Royal Mail sorting office and depot, centred around one of three Redhill conservation areas, across the station using the A25 or subway from most of the town. This neighbourhood includes a hotel-restaurant and unusually for a conservation area, no nationally listed buildings though some buildings are locally listed. Deep underneath the conservation area non-stopping services of the east branch of the Brighton Main Line run. This area includes four nationally listed buildings: three at Grade II and one, Fengates House, at Grade II*. Fengates is a Georgian three-storey building built out of red brick with grey headers and a moulded band above the second floor. Its roof is high and extends over the walls creating eaves. Its six panel door has a moulded architrave and porch with dentil cornice. St John's is a compact urban area on a narrow promontory of Redhill Common that is upland, with moderately sized gardens between Earlswood Common and Redhill Common, reached by a hillside access road from London Road. Five listed buildings are in this area including one at Grade II* that is the Church of St John the Evangelist. John Loughborough Pearson remodelled it following its 1842-3 construction by James T Knowles (senior), retaining only the aisles added in 1867 by Ford & Hesketh. Pearson was awarded the RIBA Royal Gold Medal in 1880 and is remembered for a series of exceptionally fine churches. These often display strong French influence: the spire at St John's has been likened to the spires of Abbey of Saint-Étienne in Caen (St Steven's Abbey). Other Pearson characteristics at St John's are the stone-vaulted chancel and the transverse arches across the nave. Pearson's most famous building is Truro Cathedral (1880) and the first English cathedral to be built on a new site since Salisbury in the early thirteenth century. This Gothic architecture is reflected by several nearby buildings. The War Memorial, with St Paul's United Reformed Church behind. On its other sides are the capitalised words Courage; Honour; and Self-Sacrifice. A further inscription beneath is graphic and includes "Flames consume the flesh. The spirit is unconquerable." World War II dates have been added since the first unveiling by Earl Beatty. Halfway along Blackstone Hill is access downhill through Redhill Common to London Road Redhill where Common expands and adjoins the south of Redhill, also known as Earlswood. Redhill is at the junction of the A23 and A25 roads. The M25 and M23 motorways are within three miles. Redhill railway station is at the junction of three lines: the main London to Brighton line, the North Downs Line from Redhill to Reading, and the Redhill to Tonbridge Line. Until 1845 there was a separate station from which one could travel to Ashford and Dover. Numerous bus services are operated to the town, by Arriva, Metrobus and Southdown PSV. In May 2008, route 100 to Crawley became part of the Fastway bus rapid transport system, following redevelopment of Redhill bus station. Air access is available at London Gatwick Airport, which lies about seven miles to the south, as well as the small Redhill Aerodrome (EGKR) south-east of Redhill town centre. Heathrow airport is thirty miles to the north-west and both Luton and London City airports are accessible by train. Redhill has a pedestrianised High Street, which is adjoined by the Belfry Shopping Centre. More shops are available at the Warwick Quadrant. There is also a street market each Thursday, Friday and Saturday, sometimes including a French market. Redhill is part of the Reigate and Banstead local government district. Not far from the town is Gatton Park, an estate once owned by the Colmans; the estate has a private chapel (now open to the public) and a Japanese garden. The town has a distinctive red-brick complex called the Warwick Quadrant, which houses the Harlequin Theatre and Cinema, and the public library, as well as Sainsbury's and other shops. The former Odeon cinema was built in 1938. It was converted into a nightclub in 1976, operating under various names until 2011 when it was closed down permanently to make way for new housing. Despite a plan to retain the listed Art Deco façade, delays in rebuilding and a reluctance to use the façade meant it fell into decay and was demolished in December 2017. Redhill has in the past hosted an annual air display at its aerodrome, as well as a steam fair. The London to Brighton Veteran Car Run passes through the town each year. SES Water, Santander Consumer Finance, AXA breakdown assistance, Travelers Insurance, and Aon plc Risk Services have their headquarters in the town. There are also three industrial and business estates: Holmethorpe Industrial Estate, Kingsfield Business Centre, and Reading Arch. Redhill Aerodrome (IATA: KRH, ICAO: EGKR) lies 1.73 miles (2.8 km) south-east of Redhill and operates pleasure flights, flying courses, and private commercial flights. 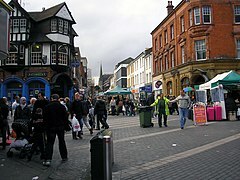 Whilst the town is a hub in commercial terms, with a shopping centre and several offices of large companies, a large proportion of the economically active population work in Greater London and other parts of Surrey. For some central government statistical purposes, Redhill and Reigate are classified as a subdivision of the Crawley Urban Area. Redhill is 18 miles east of Guildford. The average commuting distance in 2001 for workers was 13.8 kilometres (8.6 mi) in Redhill East and 13.6 kilometres (8.5 mi) in Redhill West. Unemployment stood at 1.81% in the east and 2.13% in the west in 2001. The first iteration of British Island Airways had its head office at Congreve House in Redhill. Population, type of home ownership and population density were provided by the 2011 census. The proportion of households in Redhill who owned their home outright was below the regional average of 32.5%. The proportion who owned their home with a loan in each ward was within 5.5% of the regional average, in Redhill East being 5.3% greater, or 0.9% greater than the average for the borough. The data in each ward and overall for these combined showed a proportion of rented residential property and of social housing close to the average in South East England and to that of the local authority, significantly greater in Redhill West than in Redhill East where 21.8% of property was rented from a registered social landlord or directly from the local authority. Ronnie Biggs was living at Alpine Road, Redhill, when he was arrested for his part in the Great Train Robbery. Bernard Bresslaw, actor, best known for his part in the Carry On Films, used to live in Redhill. Liz May Brice, actress, best known for her role in Bad Girls was born here in 1975. Richard Christopher Carrington, a self-taught astronomer, lived in Redhill from 1852 to 1865. It was at his observatory in Redhill that he made his famous solar flare observations. Mike Christie, singer and composer, was born and raised in Redhill. Aleister Crowley, occultist. He and his family lived at The Grange, Redhill between 1881 & 1884. Edwina Currie, the former Conservative MP and junior health minister, lived in Redhill until 2007. Michael Greco, past EastEnders actor who played Boppe DiMarco, went to school at St Bede's in Carlton Road, Redhill. Gareth Hunt, actor. Remembered for playing the footman Frederick Norton in Upstairs, Downstairs and Mike Gambit in The New Avengers. Tim Dry, best known for appearing in Star Wars Episode VI: Return of the Jedi and for being half of the duo Tik and Tok, who popularised robotic mime in the UK in the 1980s, was born in Redhill in 1952. Carole Hersee, notable for appearing as an eight-year-old child in the central image of the iconic television Test Card F, was born in Redhill in 1958. David Hewlett, actor, writer, director and voice actor best known for playing Dr. Rodney McKay in Stargate Atlantis and Stargate SG-1, was born here in 1968 before he and his family later emigrated to Canada. Bevis Hillier, biographer of Sir John Betjeman, was born here in 1940. Peter Howitt, actor and director, used to live near Donyngs Sports Centre. Kevin Kenner, American-born concert pianist, lives in Redhill. John Linnell, painter, rival to John Constable, lived in Redhill. Ian McKay (formerly Laidlaw), art critic and writer, lived here between 1976 and 1980. Katie Melua, singer and songwriter, lived here briefly in 1998. Robert Milsom, Aberdeen F.C. midfielder, was born here. Nick Hornby, author, was born in Redhill on 17 April 1957. Samuel Palmer, landscape painter, etcher, and printmaker, lived in Redhill from 1862 until his death in 1881. Henry Thomas Pringuer, organist and composer, was organist at St. Matthew's Redhill c. 1870–1880. Sophie Raworth, journalist and newsreader, was born here in 1968. Alec Harley Reeves, electronics engineer, inventor of Pulse code modulation, was born here in 1902. Chris Robshaw, current Harlequin F.C. and England Rugby captain, was born in Redhill in 1986. Anna Smith, tennis player, was born in Redhill in 1988. George Smith, England footballer and league manager, coached Redhill F.C. 1951–52. David Wiffen, singer-songwriter, born in Redhill, 1942. Max Chilton, racing driver and former Formula 1 driver for Marussia F1 was born in Redhill. Dr Lynne Hack, Conservative, returned again by the electorate in 2009, on the Adult Social Care Select Committee, Health Scrutiny Committee and the relevant Local Committee. Formerly Dr Hack was Surrey's Cabinet Member for the Environment. The second party, forming the main local opposition, was the Green Party gaining 1,591 votes versus the winning candidate's 1,761. Redhill Bowling Club, a lawn Bowling club based in Redhill. Redhill Football Club, a Non-League football club who play at Kiln Brow. Sailing, canoeing and windsurfing is available at nearby large Mercers Country Park, where a company provides moorings, boat storage, instruction and accessories, Aqua Sports Company a Royal Yachting Association (RYA), British Canoe Union (BCU) and Adventure Activities Licensing Authority (AALA) recognised centre. St. Bede's School, a secondary school specialising in Music and IT. East Surrey College is based in Redhill. The Warwick School, a state secondary school is in Noke Drive. Dunottar School, close by Redhill Common. Founded in 1926, this independent girls' school moved here in 1933, into "High Trees", built by Walter Blanford Waterlow in 1867. ^ "Nomis - Official Labour Market Statistics". Nomisweb.co.uk. Retrieved 10 February 2019. ^ a b The National Gazetteer of Great Britain and Ireland, 1868. Much of the road was built on the course of a Roman road. ^ a b c "Reigate and Banstead online information". www.reigate-banstead.gov.uk. ^ "Holmethorpe Industrial Estate". www.holmethorpe.org. ^ "Case studies: Water Colour: Description". Commission for Architecture and the Built Environment. 18 January 2011. Archived from the original on 18 January 2011. Retrieved 2 October 2012. ^ "Water Colour, Housing and Estate Developer's website". Archived from the original on 21 July 2017. Retrieved 19 February 2019. ^ "Search the List – Find listed buildings - Historic England". list.english-heritage.org.uk. Archived from the original on 24 April 2012. Retrieved 15 November 2012. ^ "Map of the Redstone Hill Conservation Area" (PDF). Archived from the original (PDF) on 29 August 2012. Retrieved 15 November 2012. ^ Fengates House Grade II* listing Historic England. "Details from listed building database (1377968)". National Heritage List for England. Retrieved 15 November 2012. ^ "Map of the Linkfield Conservation Area" (PDF). Archived from the original (PDF) on 13 May 2013. Retrieved 15 November 2012. ^ St John the Evangelist Church – Grade II* listing Historic England. "Details from listed building database (1029141)". National Heritage List for England. Retrieved 15 November 2012. ^ "St John's Conservation Area" (PDF). Archived from the original (PDF) on 13 May 2013. Retrieved 15 November 2012. ^ Shaw's Corner War Memorial Grade II listing Historic England. "Details from listed building database (1242942)". National Heritage List for England. Retrieved 15 November 2012. ^ "Map of the Shaw's Corner Conservation Area" (PDF). Archived from the original (PDF) on 29 August 2012. Retrieved 15 November 2012. ^ Seymour, Jenny (18 December 2017). "Redhill bids farewell to its 1930s Odeon facade as work finally restarts on block of flats at former Liquid and Envy site". Get Surrey. ^ "Redhill - Aerodrome - Commercial Aviation Services". www.redhillaerodrome.com. ^ "Local statistics - Office for National Statistics". neighbourhood.statistics.gov.uk. Retrieved 4 April 2018. ^ "Office for National Statistics". neighbourhood.statistics.gov.uk. ^ "World Airline Directory." Flight International. 18 May 1972. Supplement 18. ^ "Derek: A Musical Savant". News. Yahoo!. 9 April 2008. Archived from the original on 12 April 2008. Retrieved 6 October 2008. ^ "Anna Smith". Player profiles. LTA. Archived from the original on 14 September 2008. Retrieved 6 October 2008. ^ "Redhill 2009 Election Results". Archived from the original on 18 August 2012. Retrieved 24 April 2012. ^ "Directory - Where's My Nearest - RYA". www.rya.org.uk. ^ "Adventure Activities Licensing Scheme (AALS)". www.aals.org.uk. ^ "St Bede's School, Redhill, UK". www.st-bedes.surrey.sch.uk. ^ College, Jarrett & Lam Copyright (c) 2017 East Surrey. "Home - East Surrey College". www.esc.ac.uk. ^ "The Warwick School". www.warwick.surrey.sch.uk. Wikivoyage has a travel guide for Redhill.